Being a weatherman these days is as much about personality as it is about accurate predictions. And you dont find characters like Larry every day. 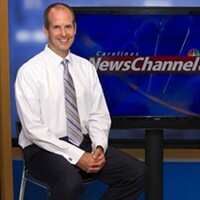 In addition to seeing him weekday mornings on WCNC, you can find Larry (and his killer coif) volunteering and speaking at events all over the city. If you get the chance to meet him in person, hes a real trip. And when you do, ask him what his hair secret is ... were dying to know.